Description of Property: Ground floor: Large combined living/dining room with built in kitchen featuring slate worktops, double stainless steel sink, electric multi-function oven, separate gas hob unit, fitted cupboards, washing machine, fridge freezer and microwave oven. 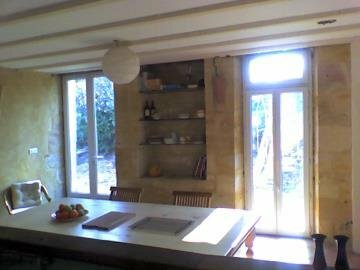 This room has two sets of french doors leading onto the garden, where you can sit in sun or shade to relax or eat outdoors. There is a woodburning stove in this room, fitted into the old stone fireplace. Double bedroom with large double bed, shelves and hanging space for clothes, bedside tables. This room also has double french doors leading into the garden. There is a further smaller room on the ground floor which could either be a second bedroom or a study, as required. 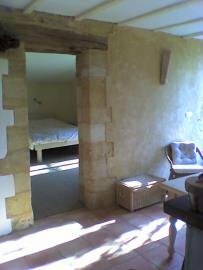 This room leads off the main bedroom, as does the fitted bathroom which has a bath with shower over, WC and washbasin. 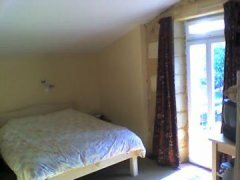 From the living room there are stairs which lead to the first floor where there is a large converted loft bedroom with limited headroom - great for a childrens’ bedroom, a guest room or possibly just for storage. The decoration is clean and modern showing some of the original stone and timbers, and using natural plaster finishes which, together with the combination of tiles and soft flooring, suit the simple nature of the house. We have installed telephone and television points. Outside Amenities: Outside there is a garden area exclusive to this house, and garden furniture is provided. It faces south but there is a large tree to provide shade when necessary. The house is within the property of the owners small vineyard but the outlook is different and there is sufficient privacy for everyone. The tenants are welcome to walk around the rest of the property, by agreement with the owners. Surrounding Area: The historic village of St Michel itself has a renaissance chateau with a medieval tower occupied by the author Michel de Montaigne, and the property and gardens can be visited most of the year. There is an auberge which is open in July and August. The village of Lamothe Montravel is about 2 km away and here there is an épicerie/butchers, a boulangerie, chemists shop, newsagents/tabac, post office and a cafe/restaurant. 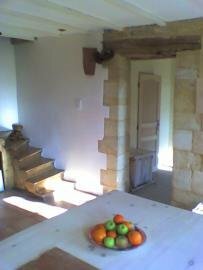 Castillon la Bataille is the nearest larger town which is five minutes drive and has everything you need including several bars and restaurants, doctors, large weekly market, tourist information, etc. We are situated in the heart of the Bergerac/Bordeaux wine producing area, and the beautiful village of St Emilion is only 20 minutes drive. It is possible to have guided tours and tastings at lots of the vineyards, apart from the usual tourist attractions. The main feature of this particular area is the re-enactment of the last battle of the hundred years war, where the british were finally driven out here in Castillon la Bataille - the outdoor performances take place several times over the summer season. Further afield, you can easily tour eastwards along the Dordogne valley taking in Bergerac, Sarlat and all the chateaux along the way, or you can go westwards to the Atlantic coast for the sandy beaches of Arcachon etc. Bordeaux is a lovely old city with lots going on culturally, and Perigueux is only an hour away. 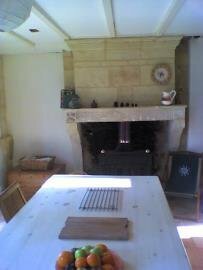 If house hunting, we are centrally placed for Charente, Gascony, Dordogne, Gironde and the Lot et Garonne..
Woodburning stove and electric heating with back-up electronically controlled petrol heating. Mains water. Septic tank. Electricity. Telephone. WiFi Broadband Internet Access. Television. Conventional oven. Hob. Microwave. Combined Fridge/Freezer. Washing Machine. Children welcome. Smokers accepted. Pets may be allowed by prior agreement. BBQ. 40 kms to Bergerac airport, 50 kms to Bordeaux airport. Pricing Info: Prices from 500 Euros per month, depending on season and length of stay. Utilities etc, extra.